October 8th, on this night in 1871, fire breaks out in a barn behind the Chicago cottage of Patrick O'Leary. 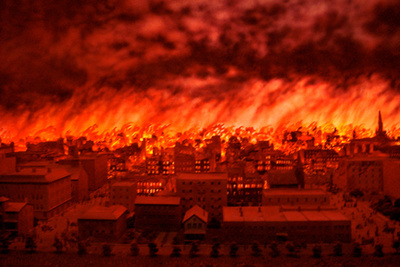 Winds blowing off the prairie fed the flames, and the fire spread rapidly, eventually consuming a four-mile-long and two-third-mile-wide swath of Chicago. 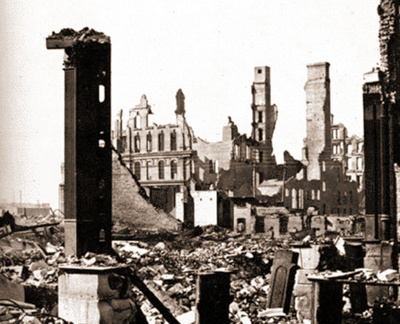 When the Great Fire was finally over two days later, nearly 300 people were dead, one hundred thousand were homeless, and Chicago's booming downtown was in ashes. Despite the devastation, Chicago would rise again and continue to be the economic centre of the American West for decades to come. Most people think of Chicago as a mid-western city, and geographically it obviously is. But economically, Chicago is best seen as the unofficial regional capital and economic centre of the American West. Because of its location on the western edge of a system of lakes, rivers, and canals that linked the city to the East, Chicago was the natural destination for both western raw materials moving East and eastern manufactured goods moving west. After the Civil War, Chicago quickly eclipsed St. Louis as the primary trading hub between East and West, and the city's fate was inextricably tied to the rapidly growing settlement and development of western natural resources. Millions of dollars worth of cattle, lumber, swine, and grain that had originated in the plains of Wyoming or the mountains of Montana was channelled through the massive freight yards, slaughterhouses, and grain elevators of Chicago. Indeed, a look at a map of the U.S. during the 1880s revealed that while all roads may have once led to Rome, by the late 19th century all railroads led to Chicago. Although the Great Fire of 1871 destroyed Chicago's downtown, it left most of the city's essential industrial infrastructure in place. Scarcely missing a beat, the towering grain elevators and vast stockyards continued to collect the growing output of the West, process it into pork sausages or two-by-fours, and send it onward to the insatiable markets of the East.